Yes, I have been shopping again (I know, what a surprise eh!?) and, much to everyone's surprise, I have purchased more beauty and fashion items. (As if I need any more right? Pfft, I am a girl..). To begin with, my first stop was Topshop. 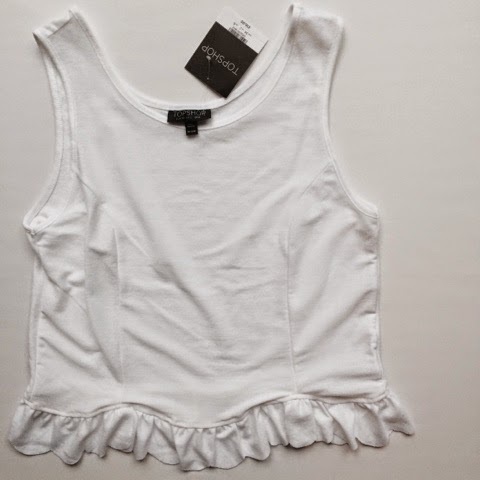 I purchased this plain white vest top with this super cute scallop frill on the bottom. I love the top and I have wanted it for quite a while now, so obviously I bought it as I just couldn't resist! This will also go really well with my black high waisted Joni jeans and black boots as the scalloped frill will add some dimension to an otherwise plain look. 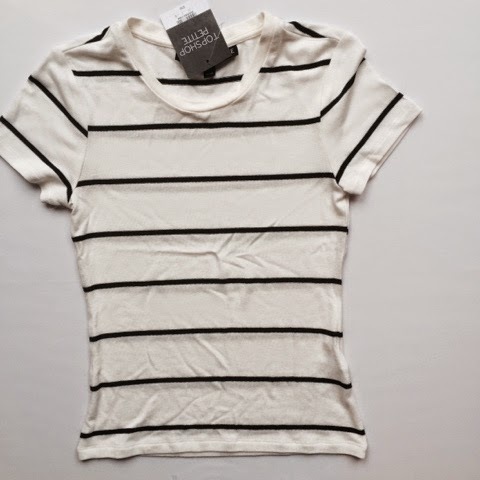 I then bought this short sleeve striped tee which I also thought would go lovely with my black Joni jeans and I could pair these with some high top converse for a more wearable and casual summer look. Next stop, good ol' H&M. I love this store so much because you can pick up some beautiful pieces for such a great price. 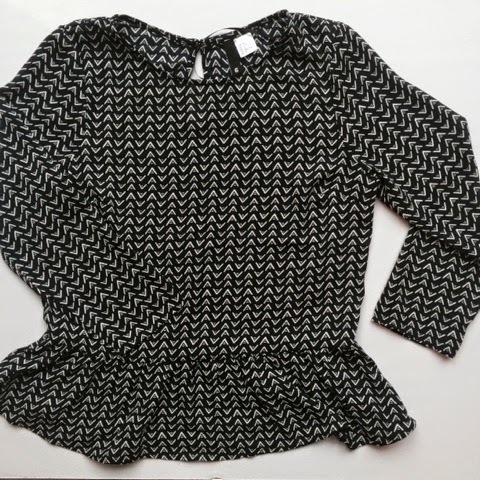 For example, this gorgeous ¾ length sleeve navy blue blouse with a peplum edge. As soon as I saw this blouse I was immediately attracted to it. It has a cute white design all over and really spruces up a dull looking outfit. The last store I went into was of course Boots. Helloooo make up!! 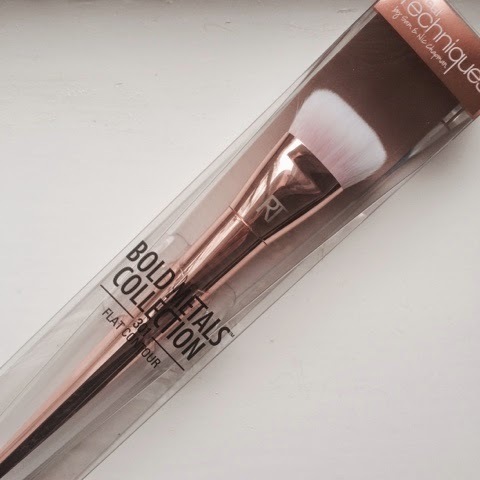 I finally bought the Real Techniques Gold Metal Contour Brush and I am over the moon! I have wanted this brush for such a long time now and I finally purchased it today. It's definitely safe to say that I cannot wait to use this baby and I'm sure there will be a blog post on very soon. 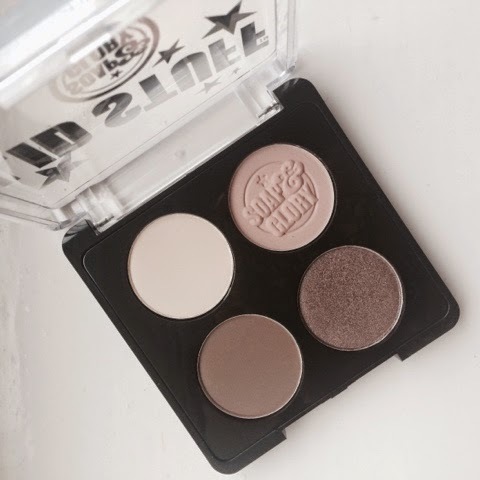 I also bought the Soap & Glory 'Lid Stuff' eyeshadow quad in the brown shade. Another make up item I have been wanting for a long time now and every time I have gone to buy this it has been annoyingly out of stock. I thought that this eyeshadow quad would be quite handy to use when going away for either the night or weekend as it is quite little and won't take up as much room as my Naked 2 palette does. 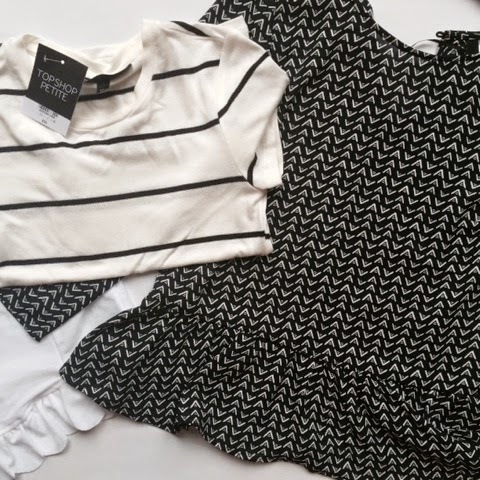 So, that is everything for this little mini shopping haul and I hope you enjoyed reading this and much as I enjoyed sharing it!